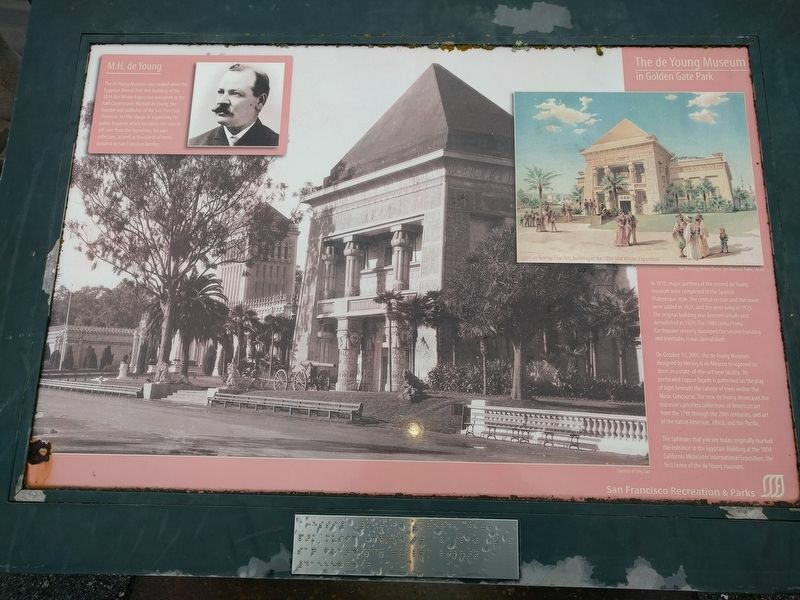 In 1919, major portions of the second de Young museum were completed in the Spanish Plateresque style. The central section and the tower were added in 1921, and the west wing in 1925. The original building was deemed unsafe and demolished in 1929. The 1989 Loma Prieta Earthquake severely damaged the second building and inevitably it was demolished. On October 15, 2005, the de Young Museum designed by Herzog & de Meuron re-opened its doors in a state-of-the-art new facility. Its perforated copper façade is patterned on the play of light beneath the canopy of trees within the Music Concourse. The new de Young showcases the museum's priceless collections of American art from the 17th through the 20th centuries, and art of the native Americas, Africa, and the Pacific. The Sphinxes that you see today originally marked the entrance to the Egyptian Building at the 1894 California Midwinter International Exposition, the first home of the de Young museum. 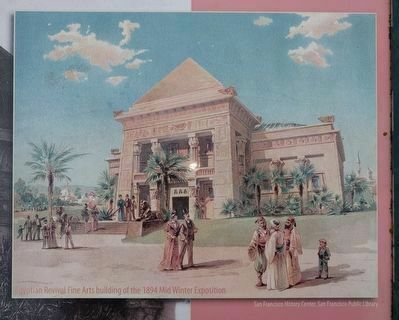 The de Young Museum was created when the Egyptian Revival Fine Arts building of the 1894 Mid Winter Exposition was given to the Park Commission. 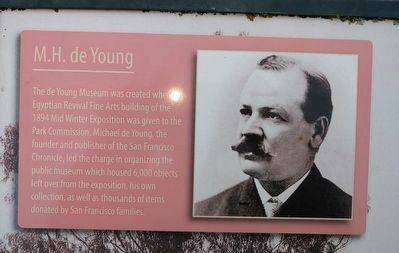 Micheal de Young, the founder and publisher of the San Francisco Chronicle, led the charge in organizing the public museum which housed 6,000 objects left over from the exposition, his own collection, as well as thousands of items donated by San Francisco families. Location. 37° 46.251′ N, 122° 27.984′ W. Marker is in San Francisco, California, in San Francisco City and County. Marker is on Music Concourse Drive south of Bowl Drive, on the left when traveling east. Touch for map. Marker is at the east end of the Music Concourse in Golden Gate Park. Marker is in this post office area: San Francisco CA 94118, United States of America. Touch for directions. Other nearby markers. At least 8 other markers are within walking distance of this marker. The California Academy of Sciences (about 300 feet away, measured in a direct line); The Music Concourse (about 400 feet away); The California Midwinter International Exposition (about 400 feet away); Golden Gate Park: A Brief History (about 700 feet away); Japanese Tea Garden (about 800 feet away); Japanese Tea Garden Gates (approx. 0.2 miles away); Planning Golden Gate Park (approx. ¼ mile away); Migration of the Monastery Stones (approx. ¼ mile away). Touch for a list and map of all markers in San Francisco. 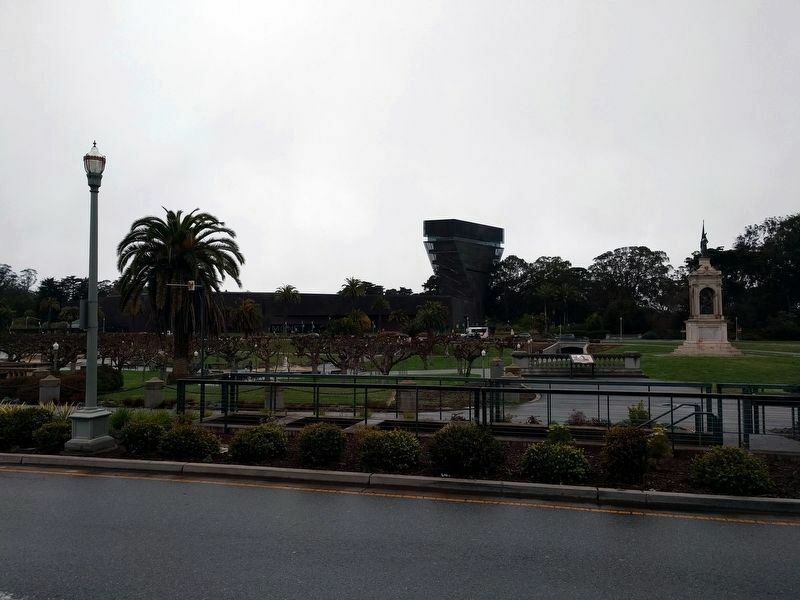 The new de Young Museum is in the background. More. Search the internet for The de Young Museum in Golden Gate Park. Credits. This page was last revised on April 13, 2019. This page originally submitted on April 13, 2019, by Joel Seewald of Madison Heights, Michigan. This page has been viewed 47 times since then. Photos: 1, 2, 3, 4. submitted on April 13, 2019, by Joel Seewald of Madison Heights, Michigan. Editor’s want-list for this marker. Better far image. • Can you help?